The VEX Jets compete at the first ever VEX robotics tournament in the Antelope Valley. The daylong event took place Saturday (Oct. 12) in the gymnasium at Joe Walker Middle School STEALTH Academy. 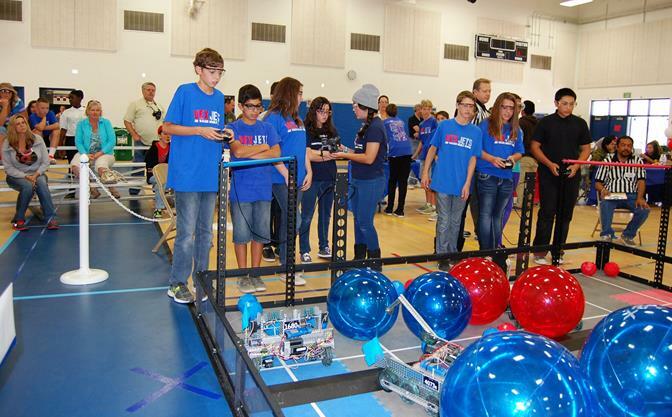 QUARTZ HILL – Joe Walker Middle School STEALTH Academy on Saturday hosted the first annual VEX Jets Toss up Competition for middle schools. The event was the first ever VEX robotics tournament in the Antelope Valley. It brought together more than 200 students from schools across Southern California, including Victorville, Northridge, Temple City, Simi Valley and Ridgecrest. 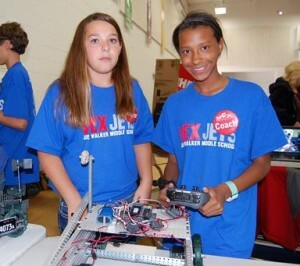 (L to R) VEX Jets team member Katie Chaisson-Doull and captain Lari Smith. 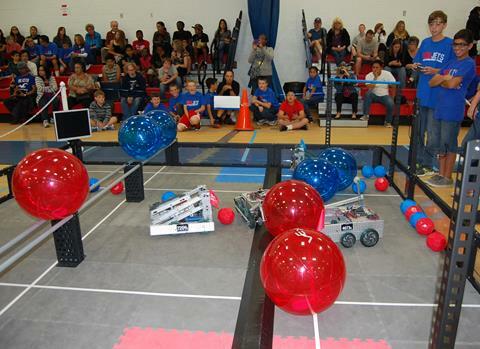 The “Toss Up” competition challenged robotics teams to score points by programming and controlling their robots remotely to place colored buckyballs and large inflated balls into scoring zones and goals on a 12-by-12-foot court. Joe Walker entered three “VEX Jets” robotics teams in the tournament. 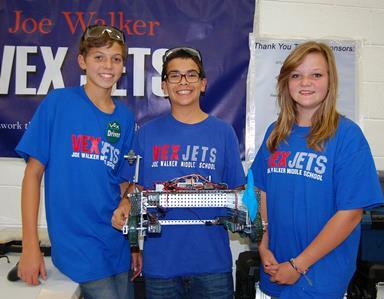 (L to R) VEX Jets team members Cole Barnett, Lucas Vasquez and Karleen Holts. The students spent about two days building their robots, said VEX Jets Team Captain Lari Smith. “I like the engineering aspect and the competitive aspect,” Smith said, when asked what she enjoyed most about the tournament. “We definitely learned communications skills and how to work well with other people,” said eighth-grader Lucas Vasquez, who programmed the robots for all three VEX Jets teams. “Of course we learn about competitiveness, but we learned that’s not everything to focus on. It’s more about having fun and building your robot,” Vasquez continued. One of the VEX Jets teams (TEAM 4073a) made it to the semi-finals and placed fourth overall in Saturday’s tournament. That team also took home the Think Award. Another VEX Jets team (Team 4073b) received the Design Award. As tournament champions, Millikan Science Academy and Murray Middle School have qualified for the 2nd Annual State Championship event for California VRC Middle Schools, scheduled to take place in March 2014. 1 comment for "AV’s first VEX Robotics Tournament"
This is awesome! Wish I had these programs in school growing up. Very saavy programs.